Lillian has only blessed our family for 3 1/2 months now! But they have been absolutely delightful! She came a little sooner than we desired (I wanted to wait until Landon was 3 to have another baby!) but God had better plans. He knew I could handle it. Still, I was nervous about adding another little person around. How was I going to manage all 3 by myself at home? How do I function if I've had a long night? I mean, I have to get up because the other 2 are still 100% dependent on me! Not to mention we're TOTALLY out numbered. But, as with Landon, they get a little easier each time around. If they get this easy each time, who knows, there may be 10 more "little McClellans" running around one day! My husband probably just had a stroke - don't worry honey. I'm content with 3 for now! 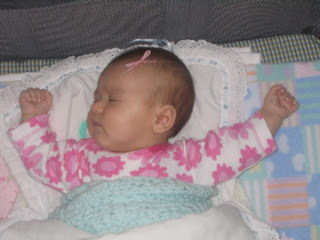 :-) Though I have to say, after Lillian's birth (she literally came flying out with no pushing or tearing!) and how smooth things have been so far, she's making me want more kids!! The irony! 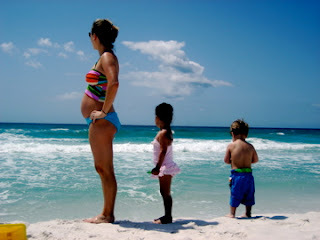 32 weeks pregnant at the beach! 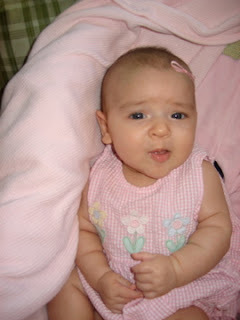 She was such a quiet baby in my tummy! But her cry, out of the 3 kids, is definitely the loudest! And she can get really worked up sometimes! Robert measuring my belly at 38 weeks! What a difference 6 weeks made in my belly size! You know, we didn't find out what we were having with this pregnancy. We figured the baby was getting hand me downs anyway and we weren't doing a nursery. Can I tell you, I wish I had done this with each pregnancy. It was so much fun to find out in the delivery room! And then to tell everyone who's been guessing along with you for 9 months - even more fun! I highly recommend not finding out. Hey, they ain't sleeping in their room or bed for a few weeks anyways when you bring them home - they want to be right with you! And they just wear the soft gowns for a while too. So there's really no hurry to pick out boys or girl stuff ahead of time! You have many years of that coming. We also thought she was a boy. Well, I thought it was a girl for the first 6 months. Olivia thought so too. 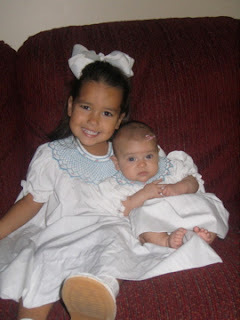 Her reasoning was that she already had a little brother so she needed a little sister! Then I had SO many people tell me I was having a boy, I guess I started to believe them. I imagined our family with another little boy and it worked - in my head a least. Now I can't imagine it not being a girl! What was I thinking - she fits right in. She was born 2 days late at lunch time! Easiest delivery and recovery EVER! The first thing I said when she came out was, "Olivia is going to be SO excited!!!" She's was born with a VERY attentive big sister - what a big helper! She gives her a pacifier when she's crying, bounces her to soothe her, and feeds her when a bottle is available! I'm not sure what I would do without her! Olivia also helps out so much with Landon when I'm busy with Lillian! She's 3 months old now and getting really cute. It's fun when babies really start to respond to you! It's so nice to get a smile or coo from them after weeks of then staring off into space! She's giggling now - especially when I hold her up to mirror! She thinks she is so funny! Little miss priss! We still can't quite figure out who she looks like though. Since Robert and I are so different - skin tone, eye color, hair color, etc - we thought she's be either like Landon OR Olivia. But she's a mix of them. 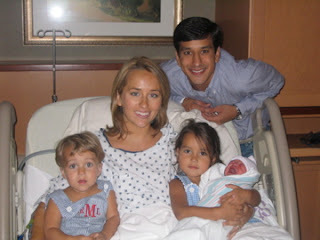 Dark hair like Olivia had, blue eyes like Landon and me, and skin that is in between Landon and Olivia's coloring. I'm not sure who's nose she has, and her eyes seem more squinted that the other two. Well, it'll be fun to see what she turns in to! I do know that she better get ready, and hold on! Because her family is CRAZY!!! We love to laugh and play rough. We love adventures and being silly with the kids! She's going to have many things to keep up with! I guess I don't have too much to say about her since she is still so young! 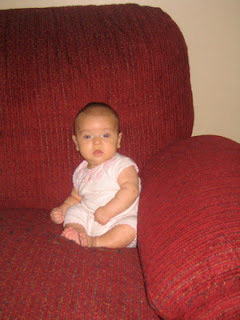 But I am enjoying every minute of her being so little because it doesn't last long at all! I just can't imagine our family without her now! Wow she has changed so much since the last time I saw her. She is so beautiful! I love seeing pictures of all the kids. What an adorable family. It is clear that she is finding her place. She KNOWS she has to be loud if she is going to be heard! haha She has 2 older ones to compete with. Although, I know she is NOT neglected! What a doll.